Starkland is one of those labels that has provided me with valuable introductions to “new music,” by which I mean not only compositions but also the performers of those compositions. However, when I consulted my archives, I realized that I have not written about a Starkland release for over two years, which reaches back to when I was writing for Examiner.com. However, at the middle of this month, the label put out a new release; and I was glad to be fortunate enough to have it come to my attention. 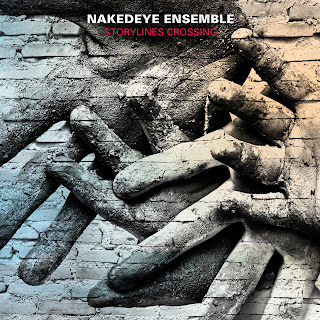 The title of the album is Storylines Crossing, and the performers are the eight members of a group that calls itself the NakedEye Ensemble. The group seems to be led by pianist Ju-Ping Song, who plays other keyboard instruments when necessary. The remaining players make for a rather eclectic bunch. The winds are Matthew Allison on flute, Christy Banks on clarinets, and Ryan Kauffman on saxophones. Naomi Gray’s cello is the only consistently bowed instrument; and it is complemented by Chad Kinsey’s electric guitar and Mike Bitts on bass (both acoustic and electric). Finally, percussion is provided by Paul Murr. The album title seems to reflect a preference for compositions with some connection to narrative, either explicit or implicit. However, the group seems to have been one of the serendipitous products of New Music Gathering, an annual conference that was launched at the San Francisco Conservatory of Music in January of 2015 and seems to live by the rule that, the more casual things are, the more things are likely to happen. Through that spirit of casualness, the album includes two pieces that are more abstract in nature, rather than narrative-based. I must confess that I am far to “old school” to embrace such a casual spirit. Nevertheless, I can also confess that I was totally blown away by the album’s opening track, a sextet by Jonathan Russell, which was one of those pieces that struck me as having little, if anything, to do with a storyline, let alone one that crossed other storylines. I have been following Russell’s work for some time, ever since I encountered him as one of the members of the bass clarinet duo Sqwonk. He has a refreshingly imaginative approach to “music with repetitive structures” (the description that Philip Glass prefers to “minimalist”), which unfolds through a thoroughly absorbing sense of both rhythm and choices of sonorities. The sextet instruments were originally flute, clarinet, violin, cello, piano, and percussion; but, because NakedEye does not have a violinist, Russell reworked the violin part for soprano saxophone. The result is an engaging kaleidoscope of sound colors, which nicely complements the other “non-narrative” track, Rusty Banks’ “Surface Tensions,” basically an exploration of new territories for the sounds of an electric guitar. Whether or not the storylines of the remaining four selections cross will be left as an exercise for the listener. There is no question that they contrast; and, at the very least, there is some sense of a “crossing” between a pioneering approach to narrative written in 1971 (Frederic Rzewski’s “Coming Together”) and the three more recent offerings, Richard Belcastro’s “Smoke n’ Wid,” written in 2006, and two pieces completed in 2015, Zack Browning’s “Decade of the Dragon” and Randall Woolf’s “Punching the Clock.” What particularly struck me was that three of these pieces (those by Rzewski, Browning, and Woolf) all constituted reflections on history. This registered with me because I have long railed against a prevailing social environment that is not only ignorant of history but also proud of that ignorance. Another exercise for the reader is to consider whether or not such ignorance correlates with that spirit of casualness against which I am inclined to rant! Mind you, when Rzewski composed “Coming Together,” he was not reflecting on history as such. He was using music to document his own impressions of the 1971 riots at Attica prison in New York. The piece was structured around the text of a letter by Sam Melville, one of the Attica inmates that was killed during those riots. What resulted was an exercise in repetitive structures that was uncompromisingly political and now induces a shudder among those of us who remember the news reports of those riots. Quite honestly, I have no idea what impact this music may have on the generations that follow my own. However, when I listened to Woolf’s “Punching the Clock,” which draws upon work songs as source material, I remembered that, when I used to listen to performances of “Sixteen Tons,” I had no idea what a “straw boss” was! (At least I did know that a lot of those work songs were sung by chain gangs, and I also knew what a chain gang was!) My guess is that, for contemporary listeners, Woolf is more likely to hit the mark in his rhetorical approach to “Punching the Clock,” even if Rzewski’s piece is the more uncompromising politicized gesture. Only Belcastro serves up narrative in a lighter vein. As the booklet observes, “Smoke n’ Wid” was inspired by the composer putting his wife’s two cats in a cardboard refrigerator box with a pile of catnip. This is a case in which, once the situation is defined, the narrative takes care of itself. This is the “fun track” of the album; and its high spirits nicely complement those of Russell’s sextet.